I'm working on my first ever GameBoy game. It's a version of the MegaDrive game by Mojon Twins. 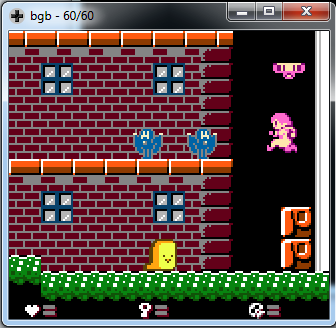 I've added tilemap, sprite with animations, basic collision, bank switching (seems to work) and GameBoy / GameBoyColor compatibility. I'ts works on real hardware. I'll certainly have questions when I'll attack the sound/music part. The green-and-black text's lowest, darkest color makes it hard to read. Yep, I'll change that to a 2 colors fonts to be more readable. News : room transition, ennemies with collision, lethal weapon and modified gameplay. I have a problem with the bank switching. I read different documents on the forums and tested different solutions. I use gbdk 2.95 with windows. I use the same syntax for all my bank. After a lot of tests, I've find how bank switching works with my version of gbdk. But now I have a problem with the bank 0, the "fixed bank". The fixed bank may go to $0150-$3FFF and the internal ram bank $C000-$CFFF. 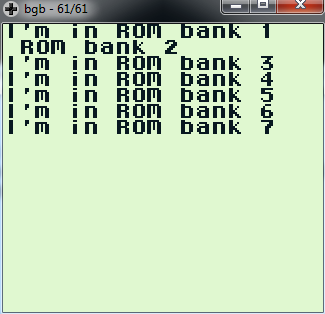 So my rom code/data of bank_0 must begin at $0150. I certainly doing something wrong in the declaration of my compilation file. The tests continue. I just changed my compilation file. I'm not using anymore -Wf-bo0 for the fixed bank and using the External RAM in A000.